There's nothing quite like crispy pieces of fried chicken tossed in a rich and spicy buffalo sauce. Add melted cheese, ranch, and crispy, buttery bread to the equation and the results are even more swoon-worthy. And although the origins of the original buffalo sauce are still being debated, this version takes both accounts into consideration by creating a mashup of the two. It's rich, spicy, and tangy and is the perfect sauce for practically anything. If you don't eat chicken, don't worry about it -- we've got you covered! Instead of chicken, try using crispy oven roasted buffalo cauliflower, vegan buffalo tofu or spicy seitan. Add the Frank's Hot Sauce, unsalted butter, white vinegar, cayenne, garlic powder, celery salt and Worcestershire sauce to a medium sized pot. Turn the heat to medium and let the mixture simmer for 10-20 minutes or until the sauce is smooth. Season with salt to taste and remove from heat when the desired consistency is reached. Reserve 1 tbsp for this recipe and store the remaining sauce in an airtight container in the refrigerator. Begin by placing half the cheddar cheese onto one slice of bread. 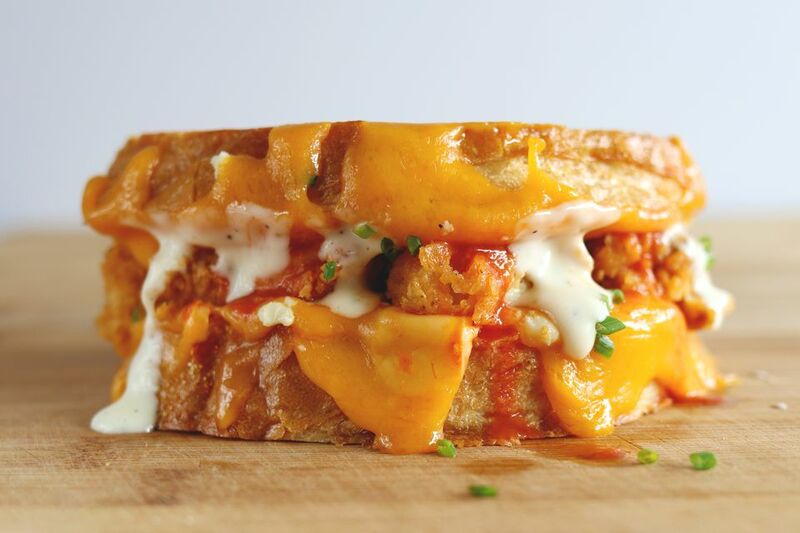 Top the cheese with the chopped fried chicken and drizzle it with buffalo sauce and ranch dressing. Add the blue cheese and the chives on top and then add the remaining cheese. Place the remaining piece of bread on top and butter the exterior of the sandwich. In a medium sized cast iron pan or in a panini press, add the buttered sandwich and turn the heat to medium. Let the sandwich cook on each side, flipping if necessary, until the bread has crisped up and all the cheese has melted. Once the sandwich is done cooking, remove it from heat, let it sit for 1 minute, and then slice. Serve immediately with an extra side of buffalo sauce for dipping.